We are incredibly excited to announce our newest addition to Follow today. We’ve been working on this feature for a very long time and we are now finally ready to release it to the world. When we first started Follow almost a year ago, we didn’t just want to copy everyone else in our industry. We wanted to provide a completely new experience for gathering competitive site information. The old experience that everyone is familiar goes something like this. When you want to look up information about a particular website, you have to perform lookup reports on several different competitive research sites & services. These sites & services can show you a ton of information about any particular competitive piece of information you want. They do what they’re suppose to do and they work really well. At Follow, we’ve also provided this by integrating with several of these companies to provide you the ability to quickly lookup information about any site. We’ve already created one of the fastest competitive tools ever to hit the market. What used to take a lot of time, our software can pull competitive information about any site across several different marketing channels in seconds. But we don’t want to stop there, we’re going to make it even better. We believe you shouldn’t have to visit our site whenever you want to know what your competitor is doing, you should just be notified when any of the sites you’re following does anything new. It can become a real hassle when you have several sites you want to pull up competitive information for on a regular basis. It takes up a lot of time and it becomes even more tedious when you need to lookup the same site across several competitive research tools over and over again. When you lookup a site using Follow, you’ll now notice a new tab that says “Newsfeed.” Click this tab to load up the news feed for that particular site. This news feed will show you an activity log of everything that site has done, across every marketing channel we monitor. We only start tracking data for domains from the date that they were first followed by someone. So if no one has followed it before we won’t have any data. If you load up a site’s news feed that’s never been followed you’ll be prompted to follow it if you’re interested in the data. If we already have the data, the news feed data will show and you won’t have to follow it to see it. However, if you’ll want to know if that site does anything new in the future, you’ll want to follow it. If you don’t follow it, you won’t receive notifications about what they do in the future. You can also view a news feed that shows all the activity for several sites at once. This can only be done if you’ve followed the domains already. To view a news feed that shows several domains at once, go to our left sidebar and click on either “all domains” or a “tag” you’ve created. Once you do that we’ll show you a news feed for every site in the tag group you’ve selected, or all of your domains if you selected that option. 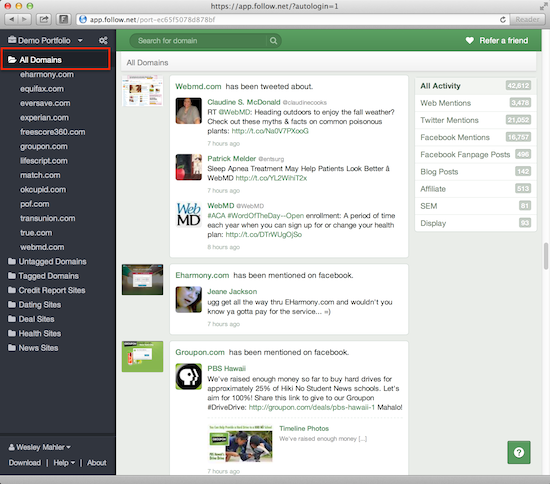 This is great if you want to see all of the activity for a specific group of websites in one location. For instance, let’s say you are selling credit reports online. You may have a group of websites you’ve followed and tagged with the world “Credit Report.” Now you can see what all of them are doing by clicking on the “Credit Report” tag you’ve created. Our news feeds can show you a variety of different stories for any particular website because we monitor several different marketing channels. 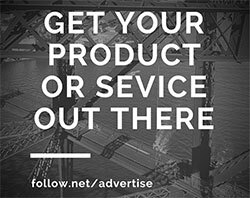 We have news feed stories related to; search marketing, display advertising, affiliate activity, recent blog posts, social media activity & more. If you only want to view a particular group of stories at once, you may do so by selecting a filter. You can select one, or several filters at the same time. For example, if you only want to see what a site does with their social media campaigns, simply filter the news feed by Twitter and Facebook stories only. Now you’ll only see stories related to Facebook and Twitter, you won’t be shown anything else. You can view our news feed across all of our different views; our toolbars, desktop and mobile sites. We’ve spent an incredible amount of time making this work all together. We’re excited to say wherever you are & however you’re using Follow, you’ll be able to access our news feeds. 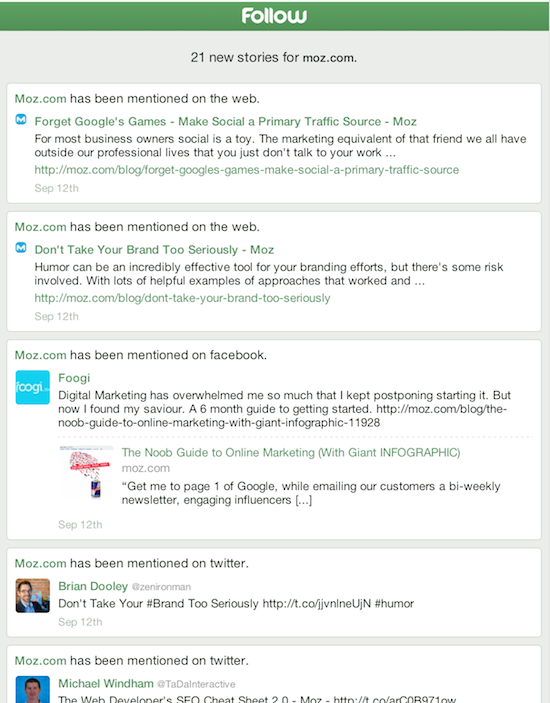 You’ll now receive email notifications for every site you’ve followed. New stories about the websites you followed will be emailed to you, by default on a daily basis. You may change your email preferences to receive no emails, daily emails or weekly emails. You can access your email notification settings by clicking on your name in our left-sidebar, and then the “My Notifications” link. Each domain will have it’s own notifications setting. We send out an email for each domain. So if you’re following 10 different domains, and each of those domains has activity every day, you’ll receive 10 emails a day. One for each domain you’ve followed. If you work with several people and they also need to know what your competitors are doing, they can receive the news feed stories too. To do this, simply share your Follow portfolio with them. A shared portfolio allows everyone who has joined to have access to the same information that you do. Everyone in the shared portfolio can see, follow and unfollow domains in that portfolio. 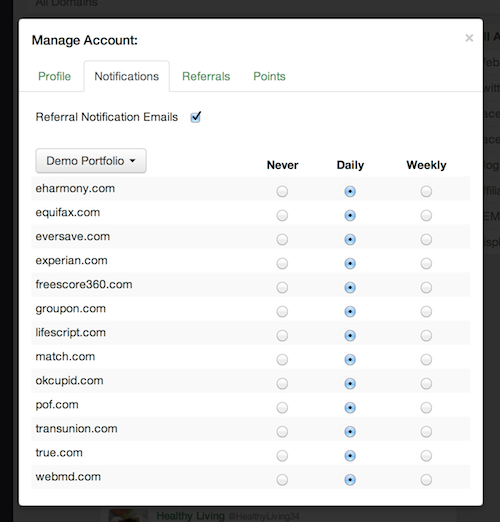 Everyone also receives their own email notifications for every domain that’s been followed in the shared portfolio. Each member manages their own email notification settings. You can have as many portfolios as you like. 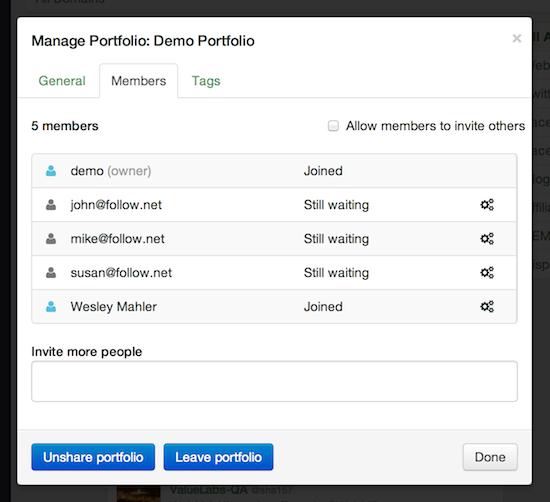 Many users have personal portfolios and another for a company that they share with co-workers. That’s everything! See it for yourself now, it’s live! 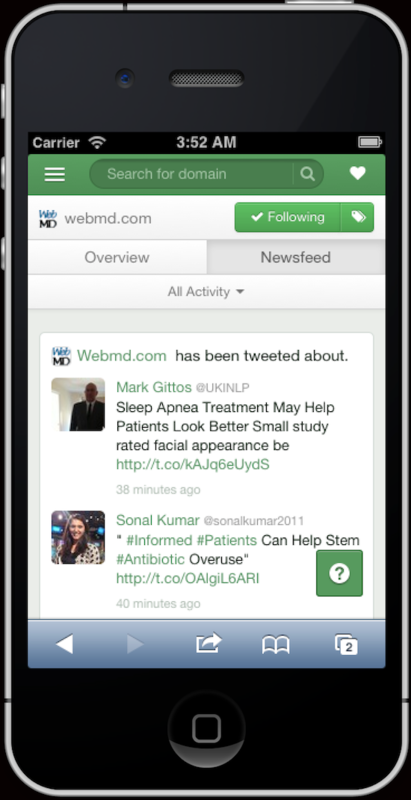 Our news feed is available now! 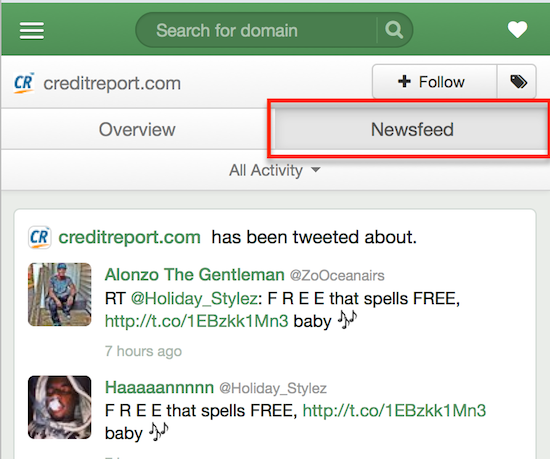 If you’ve followed any domains previously you can now see a news feed that shows all of their activity. Simply login to app.follow.net and you’ll see all of the stories immediately once you login. We’ve been tracking them since the day you’ve followed them! PS: Please do not mark all of our new emails as spam when you start receiving our news feed emails. We have made it incredibly easy to update your notification settings. If you’re receiving to many emails change your email notification settings to weekly, or disable it all together if you want to receive none. PSS: What are you waiting for? Check out the new Follow News Feed here from your phone or your computer now! This entry was posted in New Features on September 14, 2013 by Wes Mahler. Wow. This looks amazing Wes! Wes, this is tremendous. 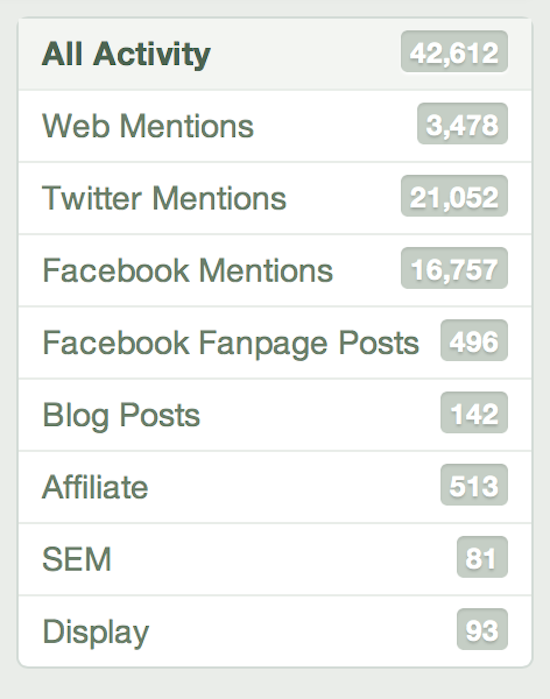 I really like the SEM and Affiliate data. This is really making my independent practice take on a whole new life! I’ve only tried this today.